I found out about Rol San Restaurant after searching various foodie sites for the best dim sum in Toronto. While there was no consensus anywhere on a definitive "best" place in Toronto for dim sum, it definitely came up over and over again and seemed to be a good place to start. I really like the beef tripe at Rol San as well as the salt & pepper side ribs. A couple times we’ve ordered the mixed seafood dumplings and we’ve found that they’re hit-and-miss – sometimes they’re exceptionally good, and other times they’re "just" edible… Hm. Also, the deep-fried mango and shrimp dumplings are very tasty and worth ordering, but not as good as the typical deep-fried shrimp dumplings at most places. The Pan Fried Pork Dumplings at Rol San (not typically found on dim sum menus) are exceptional and I have to order these all the time. They are, without exception, the best pan fried dumplings I’ve had anywhere. Tasty! The service at Rol San is fast and attentive – they’re a little on the better end of what you’d expect at a Chinese restaurant, but not quite comparable to what you’d find at Lee Garden, for example. When ordering dim sum, or any Chinese food for that matter, I am notorious for always ordering too much. I’m getting better at it, but we still find ourselves taking left-overs home everyone once in a while. I’m used to having to spend $45+ for two people like we did in Calgary, but at Rol San, $20 including tax and tip is often enough. In fact, every time we order the chow mein (around $12) I tell Michelle "remind me next time, just to order the chow mein and nothing else…"
If you enjoy dim sum and don’t mind eating on disposable plastic tablecloths, I’d definitely recommend giving Rol San a try. But if you’ve never had dim sum before, it may not be the best place to go (yet) since you have to order off the menu and there’s no photos on the dim sum menu. I think everyone’s first experience with dim sum should be at a place with cart service, no? 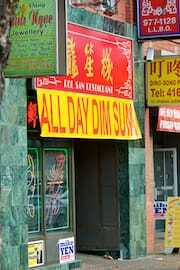 If you know of other places in Toronto that are great for dim sum, I’d love to hear about it! 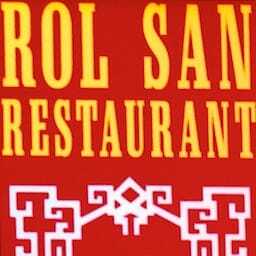 Rol San Restaurant was published on Friday, October 22, 2010 at 6:07pm EDT by Daniel Menjívar and last updated on April 11, 2018 at 9:30pm UTC .